Pressure cook the soaked basmati rice for 2 whistles with 4 cup water. Remove from the heat and allow the pressure to settle down. Fry the capsicum with little oil and keep aside. Heat oil in a handi and add cloves, cinnamon, cardamom, star anise and bay leaf. Saute a while and add finely chopped onions. Fry till it turns golden brown and add ginger-garlic paste. Saute a while and break the eggs. Add to the handi and mix well. Add pepper powder and salt to taste. Add fried capsicum and mix well. 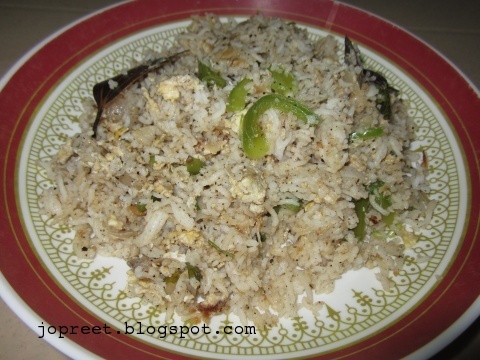 Cook for 5 mins and add the cooked rice. Mix all on low flame. Remove from the heat and serve hot with tomato-chili sauce. 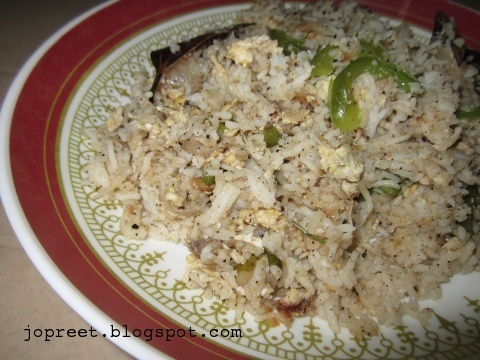 Note : You can also left over rice to prepare this pulao. wud like to try that .. will let u know when i try it out!! very nice egg rice, well done.